This mini electric 2 in 1 wood burning kit includes a 60W electric soldering iron, 1 iron stand, 5 assorted solder tips, 10 assorted wood carving tips, 15 assorted wood burning & soldering tips, 1 hot knife chuck, which make wood soldering jobs, wood working, hobbies, crafting, home improvement more convenient. 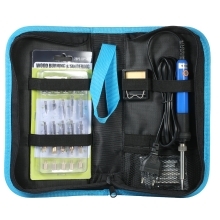 37 in 1 Wood Burning Pen Kit: Soldering Iron + Soldering Tips + Desoldering Pump + Wood Burning Tips + Hot Knife + Iron Stand + Tool Bag. 2 in 1 Soldering Iron Wood Burning Pen: Useful wood burning tools, very easy to operate and perfect for users of all skill levels. For Various Maintenance of Household Appliances: Repairing circuit boards, computer motherboards, component of mobile phone, etc. Adjustable Temperature Controlled Soldering Iron: 200～450℃(392～842℉) & more energy saving and environmental protective with 60W power. External Heating Type Electric Soldering Iron: With 5pcs replaceable soldering tips to meet your different soldering demands. Great for Rour Soldering Needs: Wood soldering jobs, wood working, hobbies, metal work, hobby, crafting, home improvement. Suitable for Both Wood Burning and Soldering: Pyrography, engraving, carving, embossing, lettering and decoration on wood, fur, peach bone, cork and leather.